Reducing waste in the grocery budget seems to be a hot topic right now. Rushed parents and over-scheduled folks are doing the best they can to keep their grocery budget low. The USDA estimates that between 30% and 40% of our food is ending up in landfills. WHAT??! Our average monthly grocery budget here on the ranch last year averaged $111. And that included wild game processing. And it even included non-consumables such as toilet paper and Kleenex. I’ve written before about various methods we use to keep our grocery bill down. I employ such tricks as using the cook-once-eat-twice method of cooking as well as eliminating as many convenience foods as possible. But today I’m talking about eating what you’ve already purchased. How can you eliminate wasted or leftover food? One of the most important grocery budget tips is to use the food you have already purchased. So although I’m not always successful, I strive to cook with zero waste in mind. I do this by making tonight’s menu plan based on what’s needing to be used. For instance last night I was in the mood to enjoy a breakfast item for dinner. It’s one of our favorite suppertime meal options. I decided I really wanted french toast. So I used the dry heels from a loaf of bread , an egg and the three egg whites leftover from making homemade chocolate pudding the other night, along with a dash of powdered sugar and cinnamon. It was delicious and it also allowed me to use the last of my homemade pancake syrup previously made to go with a special breakfast-in-bed occasion that featured my favorite homemade pancakes. Other than that one egg and a few pieces of dry bread, this meal pulled leftovers out of my fridge before they got the chance to go bad. The nights meal was planned around what was currently needing to be used. And supper was delicious! One of the ways I assure that I use leftover items placed in my fridge is to place them in see-through glass jars. 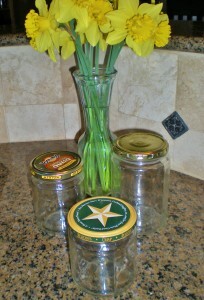 These large-mouth jars were saved for me by various family members and I use them for almost all of my leftovers. Use half an onion for a recipe? The other half goes in this large-mouth jar in the fridge. Needed 3 egg yolks for pudding? The egg whites are placed in a jar for incorporation into a future meal. That way the items needing to be used are easily seen. And because leftovers occupying the fridge are always used pretty quickly there’s not enough overcrowding to have something get shoved to the back and forgotten until it’s too late. And of course if you use the cook-once-eat-twice method of cooking you’re already cooking with the intent of freezing the extra food right away. This eliminates leftovers being placed in the refrigerator in the first place. Your freezer can really be your friend when trying to eliminate wasted food. Just be sure you label your foods & rotate through them quickly so they’re not forgotten or damaged by freezer-burn and wasted anyway! I’m just sharing thoughts on how we keep our food waste down, your methods may be different. How do you incorporate leftover items into your food plan to eliminate waste? Leftover Biscuit Dough? Make Cinnamon Rolls! 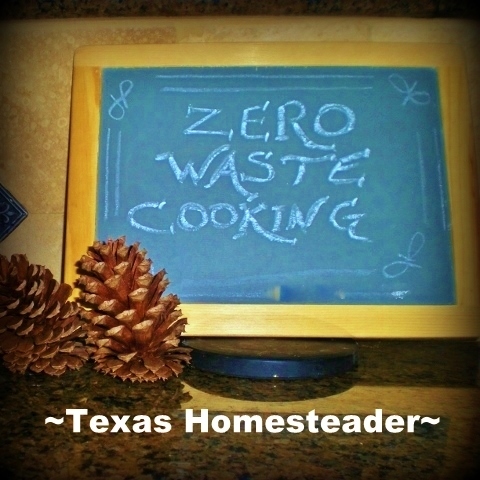 This entry was posted in Blog Posts and tagged Cooking, Environment, Frugality on July 21, 2013 by Texas Homesteader. Great tips! I know we sometimes struggle in this area, but using glass containers so you can see the food helps! Thanks for posting on the #WasteLessWednesday blog hop! I love using glass jars. I’ve actually started storing my produce from our CSA in them. They look super pretty, and I remember to use them a lot better than if they were shoved in a drawer in a plastic bag. We are empty nesters, with my husband retired and me still working. I’ve slowly geared bulk frozen meat, poultry, and pork storage and my recipes to three serving sizes, with the third serving, if not eaten at mealtime, saved for my brown bag lunch. These main dish leftovers usually go into one side of a two compartment Rubbermaid container after dinner, and are fleshed out with a side from dinner, or a fruit or salad from the produce drawer the next morning before work. If I get too many of these to eat up, I freeze just the entree part, and it works just as well. Even downsized, our freezer isn’t as full as when our two boys were at home, and these recycled entrees help keep it fuller so we don’t waste as much energy. I do reuse salsa jars, big and little, for planned “this week lunches” such as homemade soups, or “cook at work” jasmine rice or noodles to flesh out entrees. Add dry seasonings directly to the jar, or if wet ingredients are needed, add them in a mini plastic container. At work, just add seasonings, water, and microwave. All of these efforts mean my lunches are free, given that I might have thrown out the leftovers otherwise. At 20+ lunches a month for 10 months a year (I’m a teacher), that’s a considerable savings, provides me with a healthier lunch, and isn’t really hard to do. I have three gallon bags in the freezer labeled “beef”, “pork”, and “poultry”, and add veggie and meat scraps to them as I get them. Whenever one is full, it is time to make stock which I then reduce and can in pint jars. Having my own salt free stock sure saves money, time, is healthier for me, and makes homemade meals more possible when I am working as I use it a lot in cooking. I also grocery shop using a word processed inventory of what I commonly buy. I made the list several years ago, and modify it as my shopping habits change. It saves time, gas, and money as it limits impulse buying. I just highlight items I’m low on and cross them off my list at the store. This helps me not to overbuy or forget to restock when I need to. I also do a refrigerator clean out every Saturday morning and a good cleaning of my kitchen. That informs my grocery list making, and makes the kitchen a nicer place to work in the following week, encouraging me to cook more from scratch. Great post! I am quite often (unfortunately) throwing food away – I have two young picky eaters and I can’t save baby carrots that have all been licked and nibbled upon :/ HOWEVER I do try to be aware of freezing leftovers before they go bad, reusing things like stale bread for croutons and such. Your idea of cook once eat twice is a great way to think about it – thanks for making us more aware of our waste!!! Great thoughts! It is amazing what one can do with bits and pieces of food. thanks for sharing wonderful tips! I love the idea of using glass jars for this…no more out of sight out of mind!! Thanks for Linking up at My 2 Favorite Things on Thursday!! Hope to see you again this week!! Pinned! I don’t like when I have to throw a food in the garbage. I think that this is wrong. What I do to reduce the food waste is to make a checklist before I go to the supermarket. Another thing is to transform one meal into another. When on the one day I cook roast potatoes and vegetables on the other day I use the potatoes to make delicious mash potatoes. So, there is always a way to reduce the food waste. Love using glass containers because if I can’t see it, it doesn’t exist for me. Have often used leftovers in a dish akin to fried rice although I frequently use other cooked whole grains in place of rice. Many tidbits can be tastily stretched thusly. I was just telling someone the other day that our grocery bill was about $300 a month and they were shocked and couldn’t believe we could have such a low bill. I was just as shocked when she told me her bill was $800+! My husband calls me the “Leftover Queen”…nothing ever goes to waste and if it does it is given to the chickens or pigs. My favorite leftover tip is to keep a gallon sized container in the freezer and anytime I have leftover vegetables, that can be used for soup, they go in that container. When I have enough I make soup. I have even been known to throw cooked chicken or beef in the mix. Thanks for the great post! Breakfast for dinner happens around here about twice a month. Like the idea of the jars. Thanks for sharing on Rural Wisdom and Know How. Hope to see you again next week. I never thought about calling eating leftover, “The cook once eat twice method”. I like that. I’m glad I found your post on The Rural Economist’s: Rural Wisdom and Know-How Blog Hop. Since I live alone I eat lots of leftovers! I hate waste and you have some great ideas that you have shared at TTF! Just ran across you at Freedom Fridays Linky Party.Cant wait to look around your Blog.I am a Chicken Keeper,Gardner and home cook so I cant wait to look around. I have been going rounds with the hubby about my glass jar collection. He totally does not get why I prefer to store the leftovers that way! We have got to start getting control of waste… I’ve been sick so the kids have been manning the kitchen (which is great… BUT… you know?) Thanks for the inspiration! Wasting things bothers the heck out of me. The three wastes that make me crazy are wasting food, letting a car run idle & running a washer/dishwasher without a full load. For the food solution: I make a little less than a serving for each person (unless I am “investment” freezer cooking). I’d rather have them lick their plates at dinner & make them a snack later, then have leftovers. On the rare occasion when there are scraps left (no matter what they are), they become breakfast- either as is or into scrambled eggs. One thing that I have found that really cuts down on waste is not being overly ambitious with my meal plans. I tend to get excited about making new things, but it generally takes more time and commitment to actually make something new to me than I anticipate. In the past, I would buy a bunch of ingredients to make all of the great things I saw on Pinterest. However, it was too much, and everything didn’t get made and all of a sudden, I would realize that the meat was past its prime or the vegetables were rotting. Now, I try to stick to tried and true recipes with maybe one new thing tossed in each week (or each month depending on how crazy life is!) I’ve found that I now use up everything that I’ve bought and don’t have the heartbreak of throwing out food that went bad. Love using up stuff. I’m always so proud of myself! Great ideas! Always good to be reminded to eat leftovers! I was buying wide mouth canning jars to store fridge foods….then realized that the jar of salsa was a wide mouth jar I had already paid for! Duh! Now I save the mason jars for canning and use “leftover” jars for fridge foods. This may seem a bit too much, but I paint the pickle/salsa/etc jar lids with chalkboard paint, then use a white chalk pen to write what’s in them…”I” know which is mac and cheese, or potatoes au gratin, but the teen seems to unable to identify anything by sight…gotta open and smell each and everything! Plus, my OCD is happy because everything matches… I also run my dehydrator every few days, drying fresh veggies and fruits that are just about to be too far gone. For some reason, nobody wants to eat the last 6 grapes, and I am always finding half a tomato or an onion in the fridge, leftover from making a sandwich. If I find it quickly, I use it cooking…if it’s been in there longer (but still edible) I slice or chop and dry it. I do this for the chopped veggie toppings left from make your own salad night, too…celery bits, chopped peppers, spinach, carrots, etc. Pretty much anything that is raw or steamed, so long as it hasn’t been buttered. Once dry, I can store them in a glass jar for later, but I often grind the veggies into powder and use the mix to flavor soups, stews, omelets, etc. I also make huge batches of homemade broths, gravies and spaghetti sauce when there’s a sale or the produce is in season, then I dehydrate them. Once dry, I break them up into chunks/flakes. They store easily in a jar and rehydrate in 15 minutes with hot water. I use them to thicken similar foods, (for example, spag. sauce flakes into chili) are very portable (camping) and I have precious freezer space open for homemade popsicles! I couldn’t agree more. I grew up where leftovers were counted on for another meal. I try to do the same. I often freeze leftover meat cut up to be used later – chicken goes into pasta, curries, on pizza, etc, pork gets used for fried rice, steak gets used for rogan josh, pasta, etc. Same with vegetables – they can get added to soups and curries or pasta later. Freezing takes the urgency out of using it up right away. You have me thinking about how the economic downturn was eye opening. How many jars like that have I tossed into recycle only to run to Target to pick up some rubbermaid containers for left-overs?! Ridiculous! This was great! We shared with our Fb/Twitter readers at homedstadlady.com. I found you on the Home Acre Hop. Great post! This is my downfall in grocery budgeting. I love the idea of glass jars. You’re right… I so often pack stuff away and forget it’s in there. Maybe this will help. I love all the previous suggestions! What I am trying to do is to clean the fridge every Friday before our grocery shopping trip. That way we take inventory before adding to the fridge. Of course, a weekly meal plan would be the cherry on top! Baby steps, baby steps. I make a lot of soups the old way they did/still do in rural southern France,based in broth. I add most leftover vegetables and things coming in from the garden, then I add various herbs and sometimes spices from India. The resulting soups are nutritious and very tasty, but always different. Our family has grown to love the warming and satisfying soups. I also use up leftover oatmeal to our grass-fed ground beef and some chopped onion for a amazing steak burger patty. This is such a helpful post for all of us who cook a lot!! Wow, thanks for sharing! We use the “cook-once-eat-twice” method, but we only make enough for lunches the next day. My fiance used to eat out for lunch every day, but putting leftovers straight into lunch containers is really helping. Great idea for using glass jars for storing leftover bits! Anything to reduce the amount of plastic we use. The other night my husband put stuffing away in the fridge (which was super nice) but I was planning on freezing. Because I didn’t do it right away, it didn’t get eaten (or frozen) and I had to throw it away last night. I am trying to be better about not wasting food and planning to use all leftovers or freeze them in a timely fashion. I just had a few leftover meals that were re-inventing the leftovers into new meals last weekend. I usually save the weekends for my leftover meals to work my creativity making paninis, fried rice or other creative dishes. I am going to try to be a little better about not letting anything go to waste going forward. Thanks for the reminder!!! This is a great topic! I’m also always looking for ways to reduce our waste, and we plan our meals in much the same way. I HATE throwing food away. It’s tough with two small children, they almost never seem to finish their plates. Some great tips here, though! Thanks for sharing! we make alot of soups for lunch around here. We pull whatever is leftover and make a soup out of it. My son brags about how good his soups are. He loves to help cook and he is only seven. Sometimes leftovers also go on top of a salad for lunch. Making a point to use leftovers is the key. Leaving it until it goes bad is not an option at our house. I try to keep things rotated so that we do not end up with “science experiments” growing in the back of the fridge. Sometimes what’s for dinner starts with “what’s in the fridge” I look and find inspiration there. We buy tons of fruits and veg and eat them, so often it is which of the veg need used first. When our kids were home we used the planned left-overs method. Which went something like: Sunday dinner roast, Monday leftover roast in to spaghetti sauce over noodles/garlic bread from Sunday’s bread, Tuesday, mini pizzas on garlic bread, Wednesday, chilli from spaghetti sauce, Thursday, left over noodles became mac and cheese or cassrole. Friday/Saturday, breakfast for dinner or fend for your self nights. Anything that didn’t get eaten at that point went to the dogs or the hogs… Now, without the kids (and fewer dogs and no hogs) I freeze mini meals from the leftovers where possible – some things don’t freeze well. I do make it a habit of chopping up the whole onion, and putting the ‘extra’ in a freezer bag for the next time. I do the same thing with peppers, saves prep time too. Anyway, that’s what I do, thanks for listening. 2 pieces of french toast was your dinner? Too funny—we actually use the term “FFY” for those days that I can’t cook due to busyness, illness, or whatever. Otherwise we have a leftover night, which works out awesome for us. We don’t usually pull many science projects out of the fridge, thankfully, but Tammy has got me thinking about how full the homemade condiments and leftovers shelf in the fridge is.